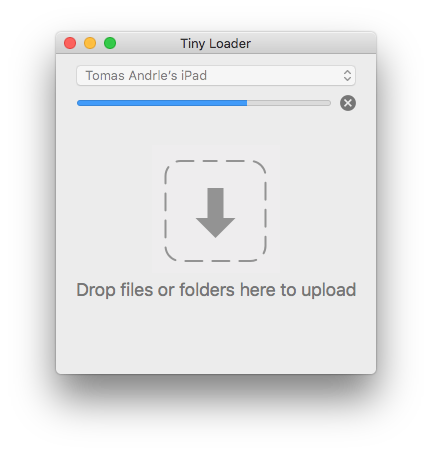 Tiny Loader is a companion Mac app for Tiny Player. Tiny Loader makes loading music into your device even easier. It automatically finds your device on the local network and lets you upload entire folders, preserving their structure. Drop files or folders into the window. Folder structure is preserved. You can still use any desktop browser to upload files, too. Just open the URL that Tiny Player gives you when you enable uploads. Tiny Loader will try to convert FLAC, WMA and OGG files into AAC before loading them into your device. You can select the desired bitrate in the settings dialog.